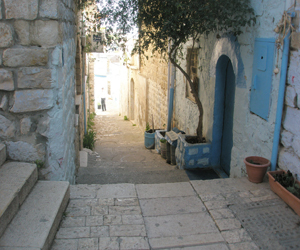 If you want somewhere quiet to stay in the heart of the Artist's Quarter in Safed, why not choose Sharon's Guest House. Close to the newly redesigned and rebuilt amphitheater of Hama‎‎'ayan Haradum Square, and just round the corner from the Maximillan Café and the General Exhibition, Sharon's Guest House offers both privacy and convenience. Situated in a no-through road for traffic, Sharon's Guest House is on a quiet land and the beautiful lantern style street lighting in this very sought after area makes it particularly romantic for an evening or nighttime stroll. With a very easy walk to all the galleries and old synagogues in both the Artists Quarter and the Old City, Sharon's is a perfect choice for couples. With its own entrance, just up a few steps from the street, and private bathroom, Sharon's Guest House offers it guests complete privacy from the outside world. The room is delightfully furnished and decorated with a very comfortable double bed with an iron bedstead that fits the ambience of the quarter. The décor itself is color coordinated with prints on the wall, and well chosen bed linen. This all really helps guests to feel relaxed and to unwind while enjoying the peace and quiet of the area. There is plenty of room for your clothes in the spacious wardrobe, and the room comes with a fridge and kettle so that you can keep snacks or drinks cold or make yourself something hot to drink. Tea or coffee is provided. The room is equipped with a table and chairs and there is cable TV situated so that you can watch from the comfort of your bed. The roomy bathroom has a bathtub with a shower inside, so you can indulge in a bubble bath if you like, or take a quick shower if you are in rush or if you are conscientious about water conservation. All the fixtures and fittings in the bathroom have been carefully chosen, and complement the guest room. Sharon is originally from England, although she has lived in Safed for many years. She runs her guesthouse with aplomb and with a self-deprecating smile that is typically English. Sharon's Guest House is open all year round and is very popular as Sharon has a lot of regular guests who book from year to year. This means it's a good idea to book your stay in advance if you want to be sure to get the dates you want. However, it's always worth trying to see if there is a vacancy at short notice, even in high season, as you might be lucky and get a last minute cancellation. Rates start at 350shks per night for the room, with discounts available for longer stays. Sharon doesn't offer breakfast, as most of her guests prefer to try the various cafes available in Safed.